Our Perth Amboy employment lawyers represent employees in all areas of employment law throughout the state of New Jersey. The Perth Amboy sexual harassment lawyers of Smith Eibeler represent residents and individuals who work in Perth Amboy and Middlesex County in claims of Sexual Harassment, Discrimination, disability discrimination, reasonable accommodations, race discrimination, national origin discrimination, pregnancy discrimination, severance agreements, Unemployment Appeals and wage payment violations. Our law firm is located in Monmouth County at the Bell Works building in Holmdel, New Jersey. Perth Amboy is a municipality within Middlesex County, which is located in central New Jersey. Perth Amboy is bordered to the north and west by Woodbridge, to the south by South Amboy, and to the east by the Raritan Bay. Perth Amboy has a total area of 5.957 square miles, which includes 1.255 square miles of water. The town is home to several large parks, including Rudyk Park, Perth Amboy Waterfront, Washington Park, Hopelawn Park, and Lucey Park. The town’s public library was the first Carnegie library in New Jersey, and is located on Jefferson Street. Perth Amboy was established in 1784. According to the 2010 Census, there are now 50,814 people, with 11,456 families, living in the town. The median age of Perth Amboy residents is 32.4 years old, and in 2010, the median income of Perth Amboy households was $47,696. Various employers in Perth Amboy include Cameo Personnel System Inc, Tropical Cheese Industries, and MDB Enterprises. 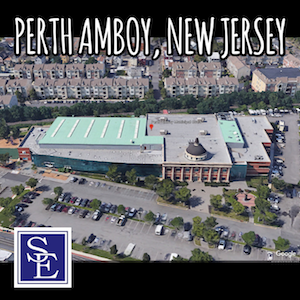 Perth Amboy is home to both public and private schools, and the school district currently serves 10,258 students. Elementary schools in Perth Amboy include Anthony V. Ceres Elementary School, James J. Flynn Elementary School, Edward J. Patten Elementary School, and Robert N. Wilentz Elementary School. Samuel E. Schull Middle School and William C. McGinnis Middle School are the town’s middle schools. Perth Amboy High School and The Academy for Urban Leadership Charter High School are the town’s public high schools. Private schools in the town include Assumption Catholic School and Perth Amboy Catholic Primary School. Institutions of higher education in the area include Rutgers University, DeVry University, and Chamberlain College of Nursing. Famous persons who live or have lived in Perth Amboy include Jay Bellamy, Jon Bon Jovi, Morgan Foster Larson, Ruth White, David T. Wilentz, and Blenda Wilson. Restaurants in Perth Amboy include The Barge Restaurant and Banquet Facility, Terrazza Restaurant, The Armory, and Fu Lin Chinese Restaurant. Perth Amboy is home to Raritan Yacht Club, one of the oldest yacht clubs in the country. Other various attractions along the historic Perth Amboy waterfront include museums, art galleries, and a marina. The Municipal Court of Perth Amboy is located at 361 New Brunswick Avenue, Perth Amboy, New Jersey. Our New Jersey employment lawyers can file a lawsuit and have it properly venued in Middlesex County Superior Court if one of the parties lives in Middlesex County or if the employer regularly conducts business within the county. Should you or a family member have an employment related legal issue and are in need of a Perth Amboy employment lawyer, please call our office today to discuss the facts and circumstances of your employment related legal issue.